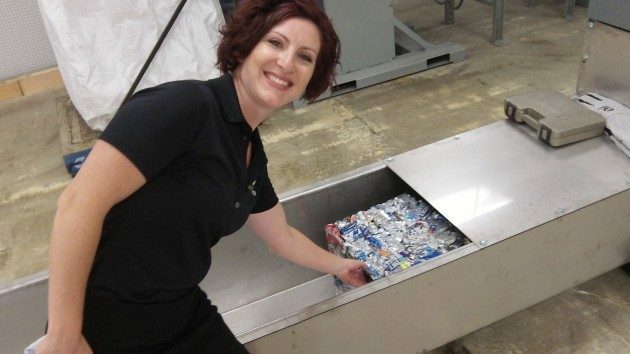 Cherilyn Bertges at the opening of the Albany Bottle Drop in August 2015. On July 22, I wrote about the coming increase and speculated that it would result in longer wait times at the Albany Bottle Drop on Santiam Highway. I editorialized that the place should be expanded, or perhaps a second one be opened, to handle the increase in volume. She also told me that whether to add more machines will be decided once it’s known how much of an increase in the flood of empties actually comes about. The cooperative has plans to set up redemption centers in Corvallis and Lebanon as well, but Bertges didn’t yet have the dates for those projects. Until they happen, Albany’s is the only Bottle Drop between Salem and Eugene. Retailers in places where there are no such redemption centers are required to keep redeeming empties themselves. Waiting at the Albany Bottle Drop one day last week. I have had some occasions to need to pick up bottles by the side of the road. I drive by people doing just that and they are not a juvie work crew. They are effectively self employed and doing more of a community service than many. So raise the rate and expand the items involved. The fish thank you. Sure beats standing out in the weather at the prior Fred Meyer or other locations. I would advocate that ALL plastic or metal containers have a deposit. Here is my new 10 cents worth, Seinfeld: The Deposit Bottle Scam. Note need why you should follow the above link. What I view on how the state decided what the return rate was. I did not see a link for 2014. Why or how come there is no data retrieved from western Oregon were by far most of the people live? A plesent day to all on your many returns. People like options. More hours of operation including early hours would be helpful. 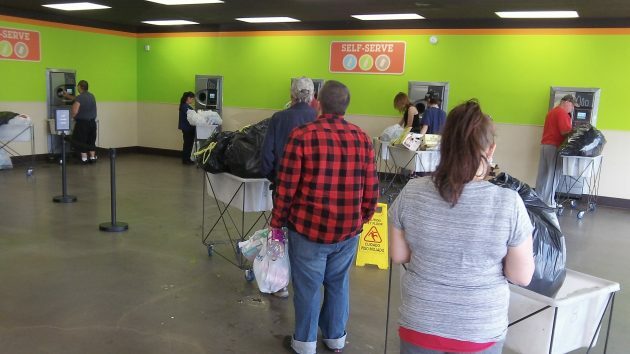 What is the Oregon Beverage Recycling Cooperative doing with all the deposit money that is not refunded? Where are they getting the money to pay for facilities & wages? I’m pretty sure the participating grocers pay them to relieve them of the bottle and can chore. Hey y’all. You’re complicating a simple thing. Once upon a time, soft drink bottlers charged a deposit on glass bottles hoping to get their glass bottles back. They didn’t care so much about the “plastic” bottles. Trash builds up. Along comes our “bottle bill”, which works well until the advent of other soft drinks. Trash builds up. It was simple when you took your cans to the store and a clerk counted them. I don’t recall long wait times. It also saved a trip to another facility. Then the stores replaced the clerk with machines. That worked for awhile until the machines started to wear out and break down. Stores kept that scenario so that the people got disgusted with the service. Wait another year until these machines start breaking down more frequently and we’ll have a worse scenario, since there is only one place to go. I’ve already seen a machine out of service on two visits. I don’t expect things to get better with age.